This is the photography page for Kirk Voclain Photography, we are the "Coolest Studio In Town" and we specialize in senior pictures. We want to answer any and all of your questions about our high school senior pictures. Kirk Voclain Photography located in south Louisiana only one hour from the Big Easy New Orleans in Houma, LA. 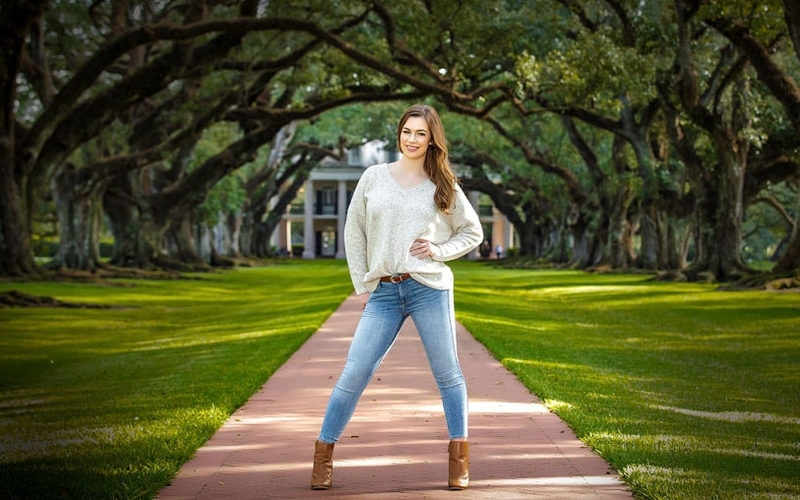 We have photographed high school seniors from all over the world, but here in the Deep South, Kirk Voclain is the first name that comes to everyone’s mind when you say senior portraits. Houma, LA is near Thibodaux, Raceland, Bourg, Chauvin, Galliano, Cutoff, & Larose LA and others. We have had seniors drive well over 4 hours for their senior pictures! When we ask why? they say, "...because you are worth it". First of all our senior pictures are different as far as posing and lighting. Kirk has been doing senior pictures since he was a senior! We carefully watch trends in the fashion industry with the goal of creating pictures that are timeless works of art. This means you get a look that your grandkids will think is "In Style" when they are taking their senior pictures. We only photograph one senior at a time so you are always extra comfortable. Do you want all your friends on social media and Instagram to be jealous and with their senior pictures were that good? We can help you with that… Kirk Voclain Photography will get inside your head and figure out just what your unique individual interests are, and from that will be able to create senior images that reflect, not just want you look like, but what you are like on the inside. We want to “tell your story” for your senior picture session. Our studio does not over Photoshop your images! We know how to pose you so that you look your best. We study posing! Did you know just by moving a leg we can take off weight?! With light we can remove even more weight if you want!! We have seen senior cry when they see their finished images because they just look so beautiful. Let us do that for you! We want to boost your self-esteem through the roof. If you want to look like a "Rockstar" give us a call. Why is Kirk Voclain Photography such a good choice? Kirk has won so many awards in the Professional Photography Industry that he has stopped counting them. One that he is extra proud of is the one where his peers voted him into the top 3 best senior photographers in the country!!! YES, right here in Houma, LA you can have your senior pictures done by a Professional Photographer that is THAT GOOD!!! Beyond that, Kirk is an international professional photography educator. He has been all over the world helping tens of thousands of other photographers learn about the art of high school senior portraits. Kirk is also a published author and blogger in the photography industry. Kirk is not just some dude who read a book or watched a YouTube video, he is professionally trained, passed his certification by the top professional photography industry association, well educated and always continues his education, has a well earned photographic craftsman degree and has a passion to make crazy awesome senior portraits! You may find some who just love photography, or who treat it as a business. But Kirk takes it to a whole new level of passion, now that is very rare. It a total Win/Win when you choose us for your senior pictures. You have nothing to loose and everything to gain with our senior portrait sessions. What can you gain? You will be a "Rockstar"! You will look like a "Movie Star"! Choose us for your senior pictures and in 10 years, you will look back on that decision and you will say it was the BEST one you made your whole senior year. You have waited 12 long years for this moment. Do not trust your senior pictures to just anyone. Experience counts!!! You are the best; choose us when you just have to have "The Best" senior pictures. We always have an unannounced and unadvertised special at the end of every year. Starting in the month of October all session fees are 1/2 off!!! For more info about Senior Picture pricing click here or call us for all the details. We have a reputation of being expensive. Don't listen to those who tell you this, check for yourself, many times we have found that our pricing is less than $50 from every other senor picture photographer in town. Please contact us for more information, to ask any questions or to book your senior photography session. You can email us, call us, text us, or even if you wish connect to us on our social media accounts below.